A couple of days ago, I found out that a local Audi dealer would be getting two of the new (Euro-spec) A4 allroad quattros for test drives and for special events. 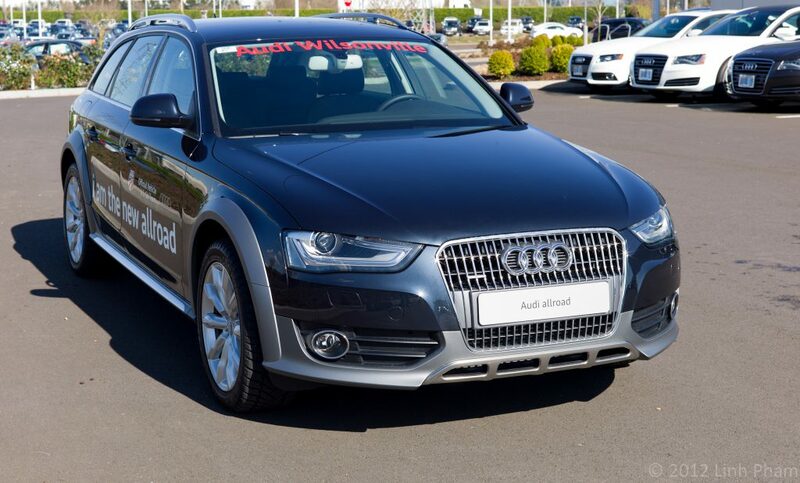 With huge thanks to Scott Mitchell (of I Am Audi fame), I was given a chance to test drive one of those allroads. The last time the United States was graced with an Audi allroad quattro was in 2005 when the C5 A6 Avant-based allroad quattro was sold with either a 2.7-litre twin-turbo V6 engine or the 4.2-litre V8. In the United States, we were left with just the A6 saloon and Avant for the 2006 model year. In its place, the United States would get the full-sized Q7 crossover. We also missed out on the C6 A6 Avant-based allroad quattro when it was released in Europe. At the 2009 Geneva Auto Show, Audi announced and displayed the new B8 A4 Avant-based allroad quattro; as with the C6 A6 allroad quattro, the new A4 allroad quattro was only sold outside of the United States… until now. 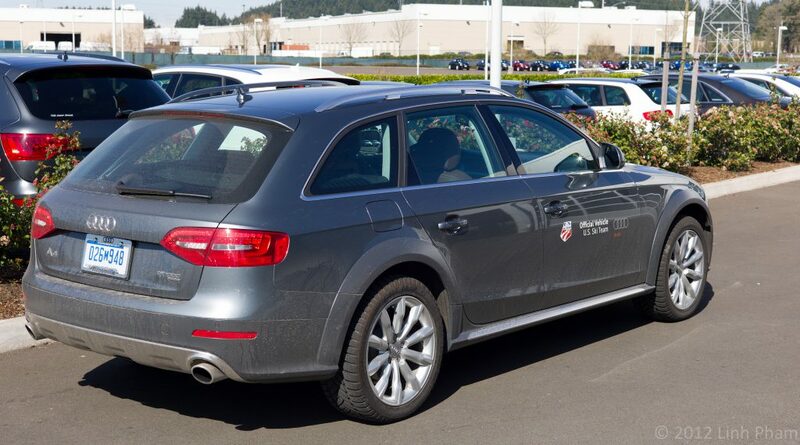 In February of this year, Audi launched the facelifted B8 A4 allroad quattro in Park City Utah and announced that it would be sold as a 2013 model year vehicle, replacing the A4 Avant. As with the current A4 Avant, the new (to the US) A4 allroad quattro will have the same 2.0-litre inline-four engine producing 211 BHP and 258 lb-ft of torque we all know and love. Unlike the Euro-spec allroad that I got to drive that was equipped with the 7-speed S-Tronic dual-clutch transmission, the US-spec version will receive the ZF-sourced 8-speed automatic transmission. Another likely difference between the Euro-spec and the US-spec allroad will be the suspension dynamics. The Euro-spec version is somewhere between the stock and the S-Line’s suspension in a B8 A4 saloon or Avant. The US-spec allroad will most likely have the same or very similar suspension and handling of a stock A4 Avant. While driving, I got to play around with the various Audi Drive Select settings, including Dynamic, Comfort and Economy. Dynamic and Comfort is essentially the same as the current Audi Drive Select available for the A4 saloon and Avant. On the other hand, Economy is definitely something that hypermillers would like as it definitely neuter throttle response. Thankfully, I could still use the paddle shifters to temporarily bump out of Economy as needed. On the inside, the A4 allroad quattro will get the same updated interior as the 2013 MY A4/S4 and A5/S5. I really liked the matte-finished wood trim in the allroad that I test drove. Everything else was definitely up to Audi standards when it comes to ergonomics, fit and finish, and tactile response of buttons, dials and switches. If I were to purchase or lease a 2013 A4 allroad quattro, I would get it in Glacier White with the standard allroad cladding (body colour painted cladding will be available for selected paint colours), matte-finished wood inlays if available, MMI with Navigation and the Audi Advanced Key. For now, it will be 2-3 years until it is time to replace my 2004 A4 and I really hope that Audi sends over a 2.0-litre TDI version of the A4 allroad quattro. Not only would it provide a good amount of torque, but also return excellent fuel economy and still have the same level of utility. For additional photos of the two A4 allroad quattros, please visit my Flickr album. Huge thanks to Scott Mitchell and Audi Wilsonville for providing me an opportunity for the test drive!